Country Cottage with 2 bedrooms, 1 bath, full kitchen and mountain view. 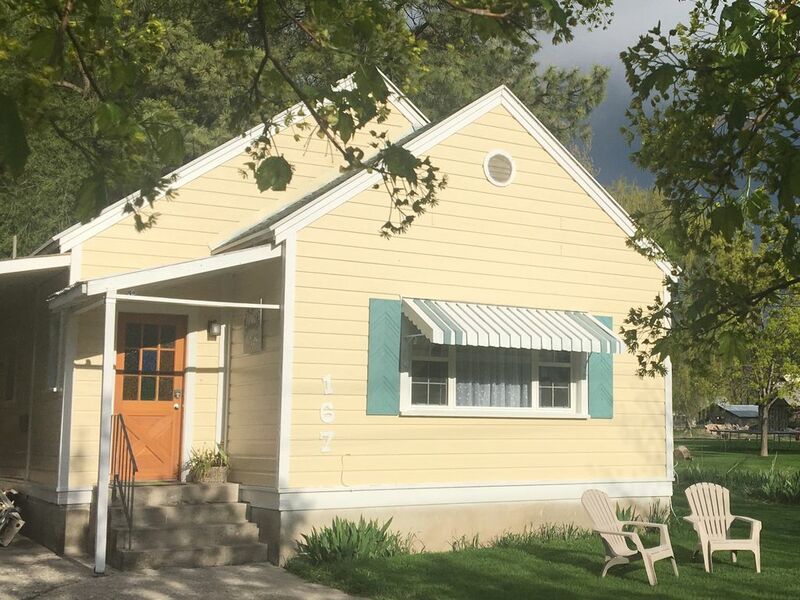 Our quaint little 1930's "grandma" cottage is named after the original owner, Julie Muir. The home is located on a 3.5-acre wooded lot, nestled amongst the trees with a spring running through the property. Wildlife frequently roams the property including deer, wild turkeys, owls, hawks, and occasionally moose. The home is completely furnished with all the amenities you may need for the stay. Mendon is a small country farm town nestled below the Wellsville wilderness range in Cache Valley. It is quiet and full of traditional celebrations such as May Day and Pioneer Day. The main city of Logan is 10 miles to the east with restaurants, shopping, university, and theater available. Home has 2 bedrooms. 1 master with queen-size bed. Second bedroom with queen size bed. Queen air mattress available on request. Graco play and pack available upon request. The photos are of a recent remodel, new photos will be added as we finish furnishing the home. Come enjoy a quiet, country atmosphere! Bruce grew up in Mendon across the street with many fond memories. We wanted to raise our family in a safe, quiet, hard-working country environment. We bought the home and property so we could build our dream home behind it on the adjacent wooded lot. Mendon is a friendly community with wonderful city events bringing people together to build memories. We enjoy the walking trails and mountains nearby. Comfortable country cottage with modern amenities. Feel like your staying at grandmas! Queen pillow-top mattresses, fully furnished kitchen, lots of storage room, washer and dryer for your convenience. The home is on a 3.5-acre wooded lot, which you can roam, build a campfire, or have a barbecue. Enjoy the beauties of nature and the wildlife that frequent the property. Tub/shower combination, toilet. Towels, shampoo, soap provided. Logan, Utah is 8-10 miles to the east home of Utah State University, Historic Main Street, LDS Logan Temple and Tabernacle, Goosner and Cache Valley Cheese Plants and Ellen Eccles Theater. Located in Cache Valley's agricultural area. A small country town with little traffic and friendly neighbors. It has early shade in the summer and nestled below the mountains. Mendon is a rural small town village, founded by Mormon Pioneers. It was the second settlement in Cache Valley founded in 1859. The restored James G. Willey historic rock home nearby: Mendonutah.net. Wellsville Mountain range, Mendon is a small rural town at the foot of the mountains. Cold Water Forest Road and Deep Canyon 1 mile from the property. Salt, pepper, and oil provided for cooking needs. Spices available. Fully furnished country kitchen with dishwasher and fridge. The dining area seats 4 with table and chairs. Lots of cabinet storage room with dishes, cooking ware, microwave, coffee maker, toaster. Clip on high chair available upon request. Mendon Library within walking distance 1 block. Personal books available to borrow. You're welcome to roam the woods also, where there are bridges, paths, and a campfire area. 2 adult cruiser and mountain bikes available upon request, talk with owners. Home is near running path, biking, and mountain hiking trails. The owner would gladly give you directions. You'll have to drive into Logan for gas, food, entertainment. However, if you want to just relax or hike in mountains, bike, or take leisurely walks there are trails nearby.